If it was easy to provide great service all the time, everyone would be doing it! Fact is . . . it takes work. Work, and the RIGHT people! The Specialty’s Café & Bakery in Pleasanton on the first floor in my office building is easy to get to, and central to a number of business buildings. They don’t have a lot of competition, and for hundreds of office workers it’s an easy stop in the morning for breakfast and or coffee, or for lunch. Over the past several months I’ve noticed – they have got this service thing down pretty good! Every time I walk in through the doors I hear it – “Good morning/afternoon! Welcome to Specialty’s!” Or, at least I hear some greeting similar! Smiling faces. Offers to try out the latest soup for lunch to see if I’d like this or that. The place get’s packed out too. Thank goodness they have seating outside, and that in Pleasanton it’s usually pretty nice outside from Spring through Autumn. They have plenty of seating indoors, but they just get so packed out there is simply no place to sit indoors. The crowd of folks gets pretty heavy, but they’ve got that figured out. You can use iPad’s stationed just inside the main entrance doors where you can browse the menu, select your order, and pay. You never even have to go up to the cash register. 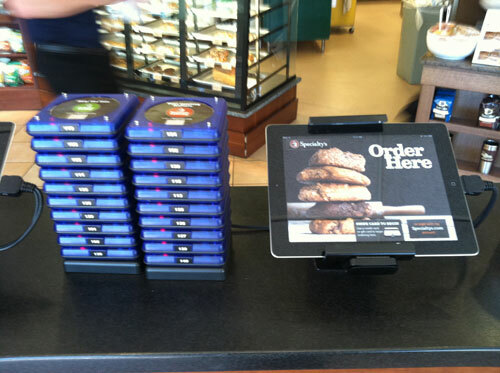 When you’ve finished paying for your order you pick up a buzzer (which are stacked up next to the iPads) and take it with you. When your order is ready you get buzzed, and just go on in and pick it up. The place is clean, and they work pretty hard to bus the tables that customers don’t bus themselves (they should but don’t always have the same courtesy as their Specialty’s hosts), so when a batch of careless customers come through, it puts extra strain on the staff. But they are always friendly and active as they work to provide you with the best experience and service they can. It’s part of their company culture. If you go out to their website you won’t find the usual “About Us” web option. That’s apparently because it’s NOT about them – it’s about YOU, their customer. Take a quick look at the careers page, and you’ll find what’s at the heart of all this – it’s their Mission and Values page for their hires. 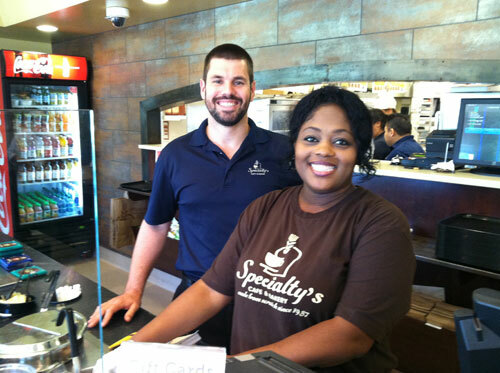 Specialty’s has recognized that to provide great service, they have to hire great staff. I love companies like this! Check out their website, and have a read of their mission and values statement. Everyone should put My Service First, like Specialy’s Café and Bakery!